Alethea Ballard is an art quilter and teacher. Exuberant about color and fabrics, intrigued by faces and flowers, and cheerful in her attitude towards creating, Alethea invites you to join her on her journey. Alethea is an excellent teacher who enjoys working with her students. She brings lots of experience and an eye for design and layout. Alethea lives Bay Area of California and is often lurking about fabric stores and coffee shops – holding a pair of scissors, of course! Alethea loves to meet new quilters and share her love of collage and quilting. Alethea Ballard gets her inspirations from a quirky palette of fabrics which she buys wherever she goes. 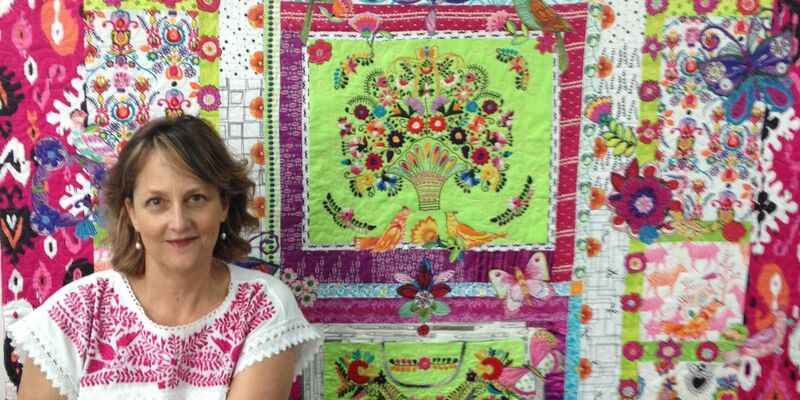 Her quilts’ colors and designs are influenced by Van Gogh, Gauguin, Gaudi, mexican folk art, and pin-up art. She creates vibrant and exciting quilts, using clear colors and cheerful images. She MUST HAVE the largest scale florals, smiling faces, and the most interesting conversation prints! Her quick, exuberant working style is a reflective of her impatience with convention, her spontaneity, and her artistic sensibility. A veteran middle school teacher, Alethea’s work as a professional quilter and author is the culmination of all her education and work experiences. Alethea’s enthusiasm for her subjects is contagious to her students and her expertise and easy working style makes them feel inspired. Next up on Alethea’s schedule is a series of fun online classes. Students from all over the globe or right across the street can explore the world of raw edge collage from the comfort of their own sewing space. Her artist’s eye and support will be accessible via Skype lessons. Join Alethea and create the unexpected!